In striking down North Carolina’s congressional district map, the Supreme Court sent Texas a firm warning Monday about how the state’s case may fare if it reaches that stage. Hours after the ruling, the federal district court in San Antonio currently overseeing the Texas case issued an order to the relevant parties asking them to submit briefs detailing how the North Carolina ruling will affect their claims, with a deadline of June 6. Judge Xavier Rodriguez, on behalf of the panel, also directed Texas to consider whether it would like to “voluntarily undertake redistricting in a special session” of the legislature in light of the North Carolina ruling, giving the state until Friday to decide. Rep. Rafael Anchia, the chairman of the Mexican American Legislative Caucus, which is a plaintiff in the case, said he interpreted the district court’s new order as a message to the state. “The way I read it is that the court is warning the state of Texas to fix these intentionally discriminatory maps or it will in a way the state might not like,” said Anchia, D-Dallas. Michael Li, a redistricting expert and senior counsel at New York University’s Brennan Center for Justice, said the North Carolina ruling will be an “important decision” for the other districting efforts winding through the legal system, including those in Texas. Democrats in Texas celebrated the ruling as a promising indication of how their arguments will fare moving forward. “I am happy that North Carolina voters secured another victory against the national Republican crusade to undermine the voting power of African Americans and Hispanics in local, state, and federal elections,” said Rep. Marc Veasey, D-Fort Worth, who has been on the front lines of another legal case against Texas’ voter ID law. The request from the district court in San Antonio for new filings in the wake of the North Carolina decision confirmed the potential impact of the ruling. Matt Angle, the director of the Lone Star Project, a liberal advocacy group, said the court “is all but screaming in the ears of Texas Republican leaders to pull back from their culture of racial discrimination” by redrawing the map. 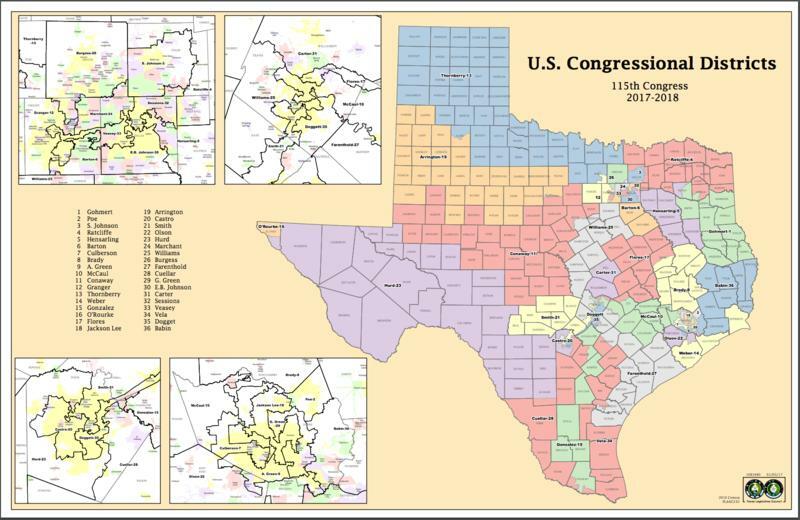 Rep. Eric Johnson, D-Dallas, sent two letters earlier this year to Rep. Cindy Burkett, R-Sunnyvale, asking her to hold a hearing on the matter as chairwoman of the House Redistricting Committee. But the committee has not met at all this session. The court had given the state till today to decide whether or not to take its own shot at drawing a legal map first. Yesterday, they gave their answer. In response to a question from the court, the State of Texas said in a filing today that it has no plans to hold a special session to redraw state house and congressional maps. The state said that its position remained that the state house and congressional adopted in 2013 to replace earlier maps were free of discriminatory purpose, did not use race as a predominant factor, or violate the Voting Rights Act – saying that it acted in good faith when it adopted court-drawn interim plans on a permanent basis. All righty then. That filing may disappoint the Texas Republican Congressional delegation, however. Several congressional Republicans told the Tribune they want Abbott to call a special session to redraw the Congressional lines. They believe such a maneuver would put their allies in the state legislature in the driver’s seat, circumventing Republicans’ worst fear: that a panel of federal judges will draw a less favorable map of its own. “I can’t speak for my whole delegation but I’ve already reached out to some of my friends back in the legislature…I said, ‘Give me a holler,'” said U.S. Rep. Randy Weber R-Friendswood, on his hopes for a special session. I’m pretty sure there will be a new map, though it may be that the changes are fairly minimal, and it’s also possible that the state can force a delay until 2020. I don’t know that I’d bet my own money on those outcomes, however. Note that Greg Abbott may well call a special session for other reasons, just not for this because the state thinks it’s totally going to win. I have a feeling this subject will come up again during the scheduled hearing on July 10. Stay tuned. The fact that this is still being litigated, as we are closer to the next census than the last one, is by twelfth proof of how messed up this system is. The 12th congressional district invalidated in NC is similar in character to those held by Rep. Doggett and Rep. Veasey. None of our districts are as nutty as NC’s other invalidated district.